Small screen but bulky fingers - a distinct reason for user inconvenience comes into play when you operate your smartwatch in a hurry. Believing this as a basic flaw in the tool, a research group at Georgia Institute of Technology has built a number of ways to rectify this once and for all. In short, they have customized the periphery and the external supporting components in such a way that you will be able to do a lot of work without touching your smartphone screen! Sounds Bizarre? Here comes an explanation on what they have literally done to amaze you. A recent press release on their official website reveals that the test was based on LG and Sony watches. The release comes with a list of 6 prominent features that include almost everything, seemingly extra, attached to your dial. According to the report, if you need to scroll through apps, you can just do so by running your finger along the wristband. Tapping on the key points placed over the Bezel could turn on eight apps. Also, you can reject phone calls by tapping the side of your phone, breathe away the errors of a dictated message on the screen, select numbers by using your palm. Result? all of these would help you interact with your smartwatch while your hand is engaged. Recently, we have noticed WristWhirl, a smartwatch that lets you control apps by using your hand as a joystick. The method of improving this technology is quite relevant, given the fact that Ph.D. student Cheng Zhang and his team wanted to improve the system with the many things we already possess. Supervising an interaction technique named WatchOut, controlling the smartwatch applications could be easier than thought. Explaining further, he implied how swiping up, down, left and right on the watch band could simplify the GPS map search technique for you. Another customized application was put to use to find his favorite or most used app at need by touching one of the eight key points drawn on the bezel. Being more useful, tapping the right side of the tool answers the call whereas the left cancels it. Another team comprising Ph.D. student Gabriel Reyes and his coworkers are trying to explore a hands-free environment for all smartwatch users. Inspired by a little incident of his wife blowing off a piece of fuzz while she was still holding their child, Gabriel, and co. developed Whoosh, an application that uses a machine learning algorithm on your breath pattern to recognize the job you want to do with the watch. Interestingly blowing, exhaling, shushing, sipping or puffing on the screen can accept or ignore calls, edit, erase or send texts, transfer contents from the watch to any smartphone. 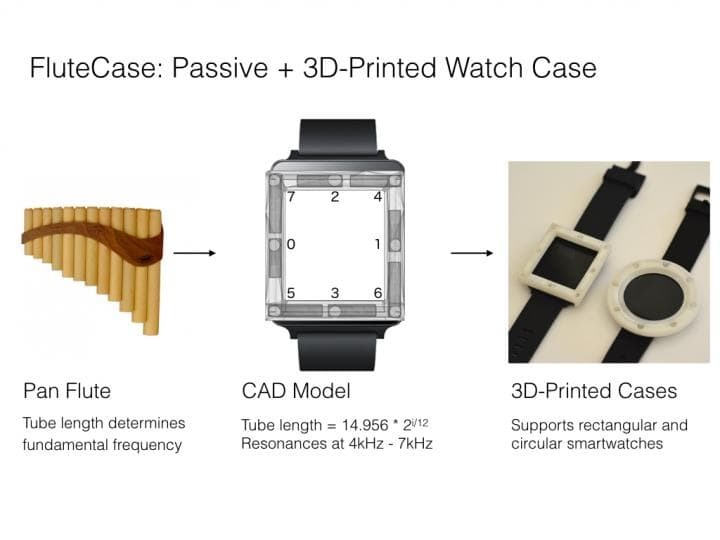 Gabriel's labmate Dingtian Zhang, a Ph.D. student fabricated a 3D-printed case for the purpose of 8 tapping points based bezel. These points are basically holes with varying lengths. When a user blows into the holes, it generates a specific frequency that matches with the target and serially, the intended job gets done. The last one of these being TapSkin, it involves your skin, to be specific, the backside of your hand to input 0-9 numbers. This is done using a microphone and inertial sensors to follow 11 different tapping locations on a person's skin. The research team hopes that using our day to day actions, other prevailing instruments and application will be improved over time. The complete research report has been published recently in 2016 ACM International Conference on Interactive Surfaces and Spaces.